Residents of The Center SF receive special pricing. Please inquire. Discount if pre-registered for December Meditation Course. The practice of satsang is an invitation to Grace, allowing you to pivot into a more profound, deeply liberative trajectory of life. Satsang is an alive practice of sifting through the interior, subtle spaces of living Consciousness. This experiential discovery is accessible to everyone, guiding you on a journey of the Tantric Sadhana teachings that enhance daily life. Each Satsang is unique, drawing you deeply into your own Heart in a rare gathering of profound consideration and learning. You will be inspired to consolidate, envision, and gain deeper insight into your spiritual journey and entire life. Specific practices taught may include the Release Practice, the Intention Offering practice, the Amrita Guru practice, Japa or chanting, study of sacred texts, and group practices that raise the vibration of our awareness and unfold the possibilities of deeply rooted freedom inside. Join us for Satsang to pierce to the heart of the burgeoning energies of awakening that are moving inside us so we are able to live them in a higher evolutionary way. Note: If you would like to learn the profound practice of Neelakantha Meditation, please enroll in the two-day course on December 1-2. Students who are enrolled in the two-day course will receive a discounted price for the satsang on December 3. Coming from out of town? Here are some nearby options for lodging. Professor Paul Muller-Ortega, Ph.D., is a world-renowned scholar in the field of Indian Religion and Hindu Tantra. He is the founder of Blue Throat Yoga, which teaches the practice of Neelakantha Meditation and the elegant Svatantra philosophy of freedom in the Kashmir Shaivism tradition. He has taught meditation to thousands throughout the world, and served as Professor of Religion at Michigan State and the University of Rochester. Paul brings to his teaching the rare combination of knowledge and experience, taking students on a profound guided tour of Consciousness that is life-changing and enlightening. Blue Throat Yoga is a School for Meditation Studies designed to help you establish deep freedom and joy in everyday householder life. You can watch video and listen to audio of Paul speaking on a variety of topics on the Blue Throat Yoga website. 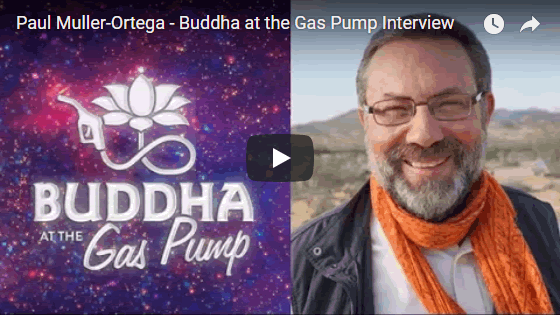 Paul was recently featured on the popular podcasts Spirit Matters and The Buddha at the Gas Pump. Note: If you also plan to register for the meditation course on Dec. 1-2, do that first—then you’ll also receive a discount code that will give you 50% off the satsang.